Well, there is a few of us that still use DB2, it's a small community, but it exists. The successor to Darwinbots 2, inventively called "Darwinbots 3" is being developed by Numsigl, you may be able to join him on working on it if he's okay with that. Though, I'm just too out of touch with web programming and haven't ever properly done PHP. You'd have to check really. If we get a proper web programmer down here, it'd be nice to have an internet page where we can see what's happening on an internet sim. Anyway, 9000 seems a pretty nice value. Okay, I might just go with 9000, even though I think 9600 is better in a lot of ways, since 9000 is both a round number and evenly divided by 360, which should make math easier for humans. In terms of where they come from: the prime factors help to determine how many different ways you can divide up the full circle evenly. 3, 4, and 6 are important, since triangles, squares, and hexagons form a full tesselation of the plane, and are the only regular shapes to do so, so you need some multiple of 12 at least (the lowest common multiple of 3, 4, and 6). If you ever wondered why there's 360 degrees in a circle, it's because it's the closest round number to 365 in base 60 (which was the base the Sumerians used thousands of years ago). Their number system was base 60 because it makes math easy: 60 divides cleanly in to all sorts of different divisors. For Darwinbots, we have a similar requirement. The more ways there are to divide the circle in to even parts, the more different symmetries are possible, or at least easy. The prime factors show you the raw ingredients to combine to divide the circle up. 2 is an important prime factor, because splitting things in to halves, or quarters, or sixteenths, etc. are very natural ways to break things apart, and can easily mimic the way cells in biology cleave in half during reproduction. 3 is important, but multiple copies of 3 aren't so much: being able to split things in to thirds and being able to represent 30, 45, and 60 degrees is important, but being able to represent 40 degrees or divide things in to 9ths isn't very important. Sunweaver is sort of built to be base 10, to make math easy for humans, so 5 is an important factor in so far as 10 is. But 7 isn't an important factor. It would let you split circles in to 7ths, but there probably isn't much call for that. As the prime factors get larger, they become less useful. About the only use 101 would be for is if the bot had 101 segments. Otherwise there's not much call for splitting a circle evenly in to 101 pieces. So generally speaking finding a good number is balancing the needs for 2, 3, and 5 as prime factors, taking up as much of the [0,9999] range as possible, and making it easy for humans to do the math. I knew about prime factors, I just meant the number 9600 as an option in and of itself. It didn't divide cleanly at all into 360 so even as an option for better primes seemed a bit unusual. I suspect actually having 7 could be a useful prime. Less useful then 2, 3 and 5, however there's still a reasonable chance a bot could have 7 segments, 11 and 13 and 17 being reasonably useful as it's not unimaginable for a bot to have that many segments, and in the case of multi-bots. As you get larger primes less numbers use them, however these are just the first few primes so will crop up regularly. How about one full circle = 9000 units. That's 360 degrees * 25, which gives prime factors of 2^3, 3^2, 5^3. And it's relatively easy to remember. By comparison, 9720 gives prime factors of 2^3, 3^5, 5. Another option is 8640, which is 360 * 24, which has prime factors 2^6, 3^3, 5. Not as easy to remember as 9000, but lets you split the full circle in to 64 equal slices instead of just 8, at the cost of not being able to slice things in to as many 5ths. Yet another option is 9600. That's not a multiple of 360 degrees, but it does have a lot of nice dividers. Its prime factors are 2^7, 3, 5^2. 9360 is 360*26 giving 2^4,3^2, 5 and 13. 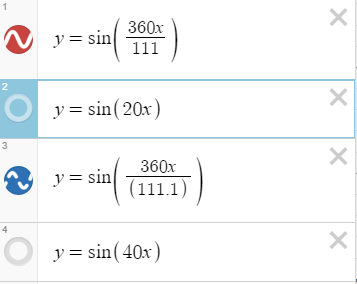 9720 as you mentioned is 360*27 giving 2^3, 3^5 and 5 however is a bit of a weirder one for remembering. 9990 is 111*90 giving 2, 3^3 , 5 and 37. I decided to pull out desmos just to try a few sine graphs. Equation 1 satisfies full wavelengths for 999 and 9990. Equation 2 satisfies fitting a number of half wavelengths for 999 and 9999. Equation 3 satisfies fitting a full number of wavelengths for 9999. Equation 4 satisfies fitting a full number of wavelengths for 999 and 9999. I just think trying to achieve a slightly nicer number to mark the end of sin/cos range might be better, so that people can memorise the division quicker to make coding bots a bit easier. I can't imagine you needing even 999 memory slots, although expanding early on might be best just to ensure you don't run out, and so it doesn't end up with dedicated free slots sandwiched inbetween slots defined to a sysvar. Ahh I understand the intentions for simplifying things. For finite loops, I'm not sure you need code for that, you can just make repetitions of DNA to loop with any checks needed. Then it prevents easy setting up of huge loops, and shows truly how long a bots DNA is. A few quick questions - Will bots be able to stick to things, like ties do in DB2, and will they be able to stick to "shapes" or such? Also, are shapes going to be reworked at all, perhaps being able to have some extra properties of their own like buoyancy or mass (allowing pushing of shapes by bots)? If that 900-odd memory location is to do with seeing other members of the species, yeah. I'd also love to setup a bot which can form a string and be properly bouyant...Ah, so many things to do! also i just looked at the description of the mutations sim in red and its not far off from what i do.. definitely needs an update since the chloroplasts... i'll start one up..
i also let the sims interact a little and i think i need to start over because even though mutations seem to go well before it almost seemed to have stopped for algas in one sim and animals in the other before i interacted them... but was still interesting to watch happen. I've been trying to force an alga to reproduce a couple of times quite quickly if no other alga's surround it (similar to a spore of fungus or plant seed growing) and then stay stably growing in a cluster. Alright dude, it will be a while, I want to add a couple of my evolutions in here a well, then I will run a proper F1 league and a MB league with all these new bots. Thanks for posting bots again btw. It was kind of dead in here, at least in this specific section of the forum. Oh, and sorry for not including your crossover of FF and QuickDraw, it was kind of a pointless hack and ran too slow for me to care. Ah don't worry, can't wait to see the new leagues. It'd be nice if we could try get a few folks interested in DB again, I tried to pull some from a sciency forum a good few months back but nobody seemed to notice. I'm hoping at some point to try and get a bot in the medal tables (1st, 2nd or 3rd) in at least on of the leagues, although I can never understand the code in moonfishers bots.